The entire team at the Novotel La Rochelle hotel welcomes you to Charente-Maritime. Take advantage of our location close to the downtown area to visit "La Rochelle, belle et rebelle," taste oysters and stroll along the seafront. Just a 10-minute walk from the beach and the Old Port of La Rochelle, our 4-star hotel boasts a privileged location from which to explore the city. Our rooms, renovated in January 2018, are the perfect base for your vacation or business trip. 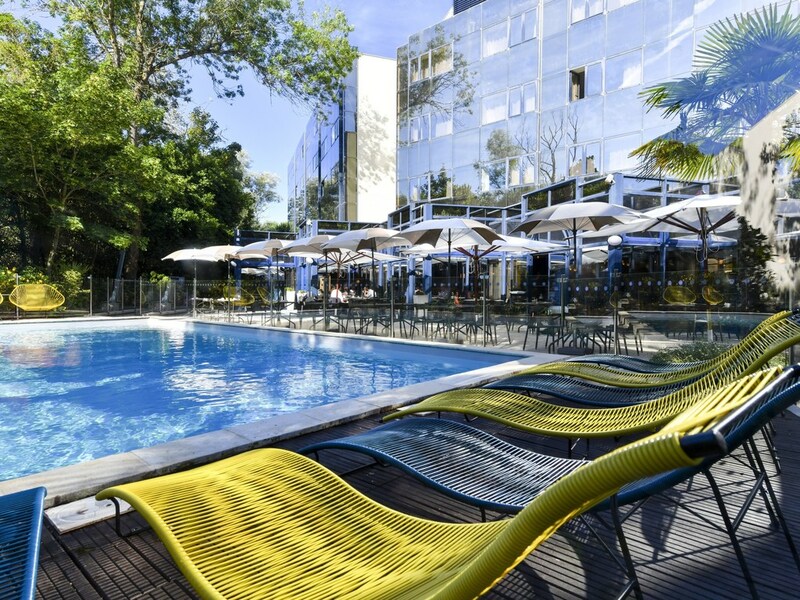 In the heart of Charruyer Park, the renovated Novotel La Rochelle Centre hotel boasts a seasonal heated swimming pool, a bistro restaurant and 2906 sq. ft. (270 m2) of meeting areas for your seminars or receptions. 2.5 hours from Paris by high-speed TGV train, La Rochelle is located between Bordeaux and Nantes. Wander around the fishing harbour, Old Port and Minimes marina to discover how this seaside city has evolved to combine modernity with maritime history. The 4-star Novotel La Rochelle Centre hotel boasts a heated swimming pool and private car park. Alone or with family, our hotel is the perfect base for exploring arcades streets, admiring the Old Port and its towers or visiting the Aquarium or Ile de Ré. Looking out over the islands of Ré, Aix, Oléron and Fort Boyard, its architecture has earned La Rochelle its nickname of "the white city." Discover the Old Port and its towers, the aquarium and the Marais Poitevin marsh during your visit. In a new marine-inspired ambience, the entire restaurant team is proud to offer you delicious traditional local cuisine. Our chef is committed to helping you enjoy new recipes every day. An open-plan space in a warm, friendly environment, ideal for relaxing. For a business meeting or drinks with friends, we've thought of everything to make your experience an enjoyable one. Treat yourself to one of our bartender's creations. Hotel was adequate, room had all we needed, bed was comfy,my only complain and I don't like complaining is that there was very little on the menu for us Irish folks to eat, it's very French (obviously) and struggled to find something. Good price/quality ratio. Nice bed & shower. Friendly staff. Good price/quality ratio. Nice bed & shower. Friendly staff. I was happy to see something new on the menu - had salmon for dinner. Very welcoming and accommodating to us and our dog. Good location and fantastic plentiful parking. Slightly quirky lay out to the room but well equipped. A pleasant short break. All staff very welcoming. The only problem was that we found the restaurant menu was very similar to that when we visited last September. Very comfortable stay; decided to have dinner in the hotel as well to save time - nice choice of house specials. I like the free car parking and the freedom to take my car out during the day. The single bed sheet was too small for the single bed on my first night, making sleep very uncomfortable because the bed sheet didn't fit the bed! But housekeeping changed it the next day after I informed her. There was a problem with the sink plug in my room, it got stuck and water cannot drain, housekeeping had to help unplug it. The receptionist and housekeeping staff have been very professional at handling my requests, thank you to them! I stay quite often at Novotel La Rochelle. Location is key to me. Friendly staff, good rain shower. Like the bed. Friendly staff. Comfortable room. Good breakfast. We have been customers at this Novotel for many years. We are always welcomed with a smile, the room is always spotless and the service impeccable. The bathrooms have now been renovated and are very comfortable as well. I had 2 reservations: 1) 3 people for 2 nights; 2) 2 people for the 3rd night. I got it upgraded to stay at the same room @ the cheaper rate over the marathon weekend. Very spacious & in good condition. An even good surprise is that the entrecote steak served @ lunch was the best steak I had for a week in France. We were well received on arrival as one would expect at Accor hotels- well up to standard. Our room was perfect as in was our restaurant experience. Thankyou to all your staff. helpful staff. they upgraded me for 1 night (it was complicated, i had 1 room for 3 for 2 nights, & then 1 room for 1 night afterwards). even the kitchen gave me a good surprise with the best entrecote steak so far in my french trip. I was surprised that the hotel was not up to same standard that I experienced in Luxembourg, Bruxelles and London. Rooms Rooms are very small and food & drinks below expectations. the staff were so very helpful, the hotel was attractive and welcoming in appearance and the rooms were a large size for 2 people to enjoy comfortably. the location was fantastic and the access to the park and old town provide a scenic and relaxing walk.